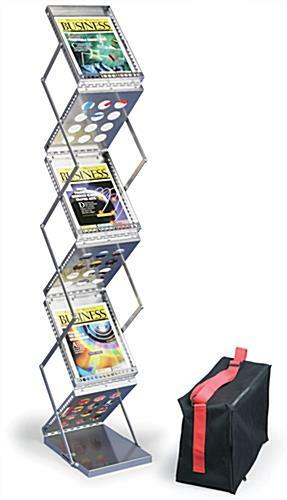 This portable magazine rack with silver finish is perfect for people on the go. 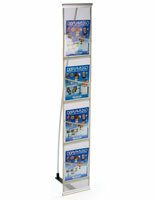 Trade shows, conventions or sales people all can take advantage of this item. 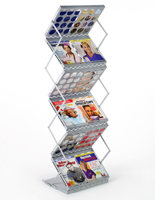 This cool magazine rack is a top selling item! While double-width styles are available (see related items below) this unit is strongly recommend this single width version. Feedback from the majority of our customers is that this single width magazine rack is much easier to handle and transport. Each literature holder comes with a carrying case. The case features a strap for toting the magazine rack over the shoulder. The literature holder weighs 17 pounds. 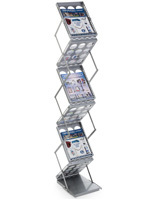 This magazine rack sets-up and down with ease. 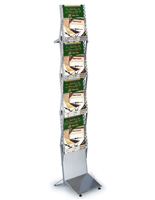 The literature holder is a simple to use unit. This wood and mock glass magazine rack folds up into a small lightweight package that easily fits into the included carrying bag. 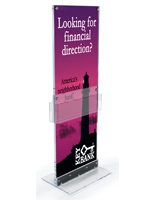 When needed this literature holder expands to full size and is ready to go in under a minute. Simply take the magazine rack out of the carrying case, expand the frame up, secure safety latch and add custom literature. 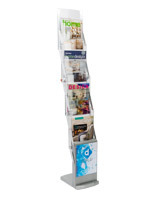 Periodicals can be displayed on either side of the holder or just use one side for a single sided display. 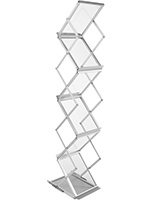 Heavy-duty silver metal with a "hollow-hole" magazine rack design eliminates un-necessary weight while giving the display its art-deco design. Shipping Size: 9" x 12.5" x 16"